First, Accords only. Please no friends cars. Don't want too many people that will require to buy a permit. 'Nuff said. So we will meet up at the woods, wherever in the parking area (since it's not hard to find us), for an hour or two and then we will head out for a nice and easy freeway cruise along i-94 in which we can get good rolling shots or video and possibly have a little fun . I choose the freeway only because it's pretty relaxing and we won't have to worry about getting lost and no tolls on this route is a plus. We will probably turn back around near the Deerfield Rd exit (before the highway ends) and drive back to the woods the way we came from. easy ~30-35 miles round trip. Back at the woods, we chill, leave if we must, or get food with some people. 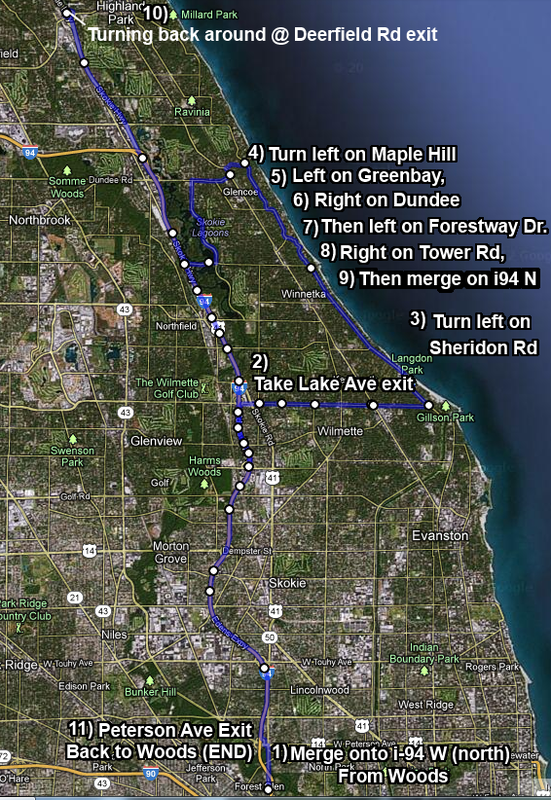 If we want to cruise along Forest Way Dr (that curvy road you see by Skokie Lagoons) and Sheridon Rd for a bit (as we did in the CPC/GLA cruise), let us know below. Sheridon road condition is CRAP, despite being in one of the wealthiest suburbs and it's kinda time consuming to drive the whole thing I'd say. Any other ~easy cruise suggestions, let us know. Yay! Someone other than me is taking initiative! It will likely be a Sunday as well. I may modify the route ever so slightly to make it more interesting. We should have a lil' potluck going when we get closer to the date. cant wait for the meet whos all going? im come around 2 guys whos all going?